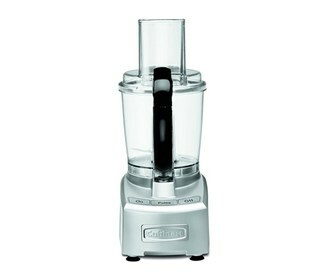 The Cuisinart 7 Cup Elite Collection Food Processor is a durable 800 watt motor food processor. Lock the lid system in place with ease and just push release buttons to remove. The 7-cup work bowl is a clear bowl with measurement markings and pour spout. It has easy on/off cover that locks in place with ease, and comes right off when release buttons are pressed. The sealed tight cover seals tightly and blade locks into work bowl to let you process maximum capacities without leaks, and empty the bowl without spills. Versatile Blade Ultra-sharp stainless steel blade lets you mix, chop, pure, liquefy and even knead dough in seconds. The processor features Dual Purpose Disc Reversible slicing/shredding disc that slips onto stem adapter to let you quickly and effortlessly slice or shred large quantities of fruits and vegetables and more. Simple Operation Touchpad features On, Pulse and Off controls blue LED indicated unit is ON.safe. 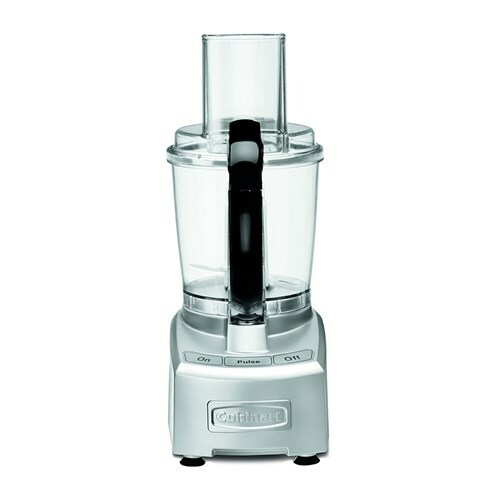 The Cuisinart Elite 7 Cup Food Processor has many exciting features for users of all types. You can extend the lifetime of your Cuisinart Elite 7 Cup Food Processor with the purchase of a FactoryOutletStore Factory Protection Plan.